I have yet to meet a professional makeup artist who does not have at least one Shu Uemura lash curler in their bag of tricks. This handy little tool has become iconic in the world of beauty. Although you may own a lash curler which bears a striking resemblance to the Shu Uemura brand, chances are the results pale in comparison. The Shu Uemura lash curler is made with great precision, and attention to detail. The Japanese have extremely high standards in the products they produce. These standards are just as applicable to big ticket items such as a vehicle for example, down to a simple eye lash curler. With many eyelash curlers, it is common to see a crease, in lieu of a smooth curl on the lashes. Not the case with Shu, the days of creased lashes end the moment you begin using it. 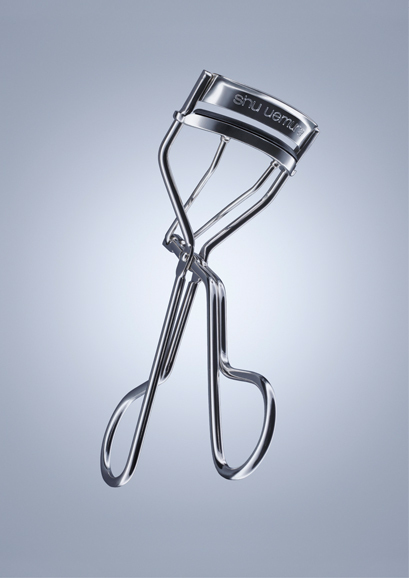 The Shu Uemura eye lash curler will make a great addition to your makeup accoutrements.